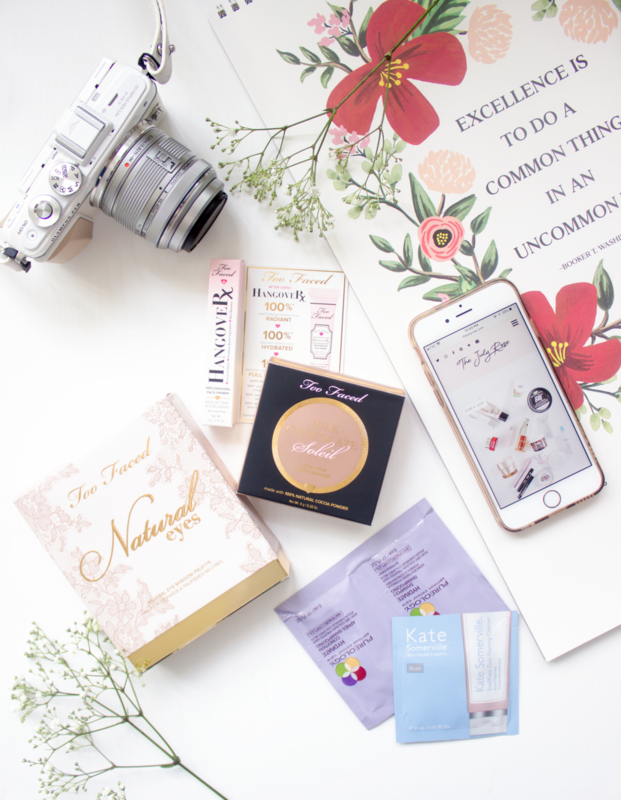 I often find that hitting the Cult Beauty website can be somewhat dangerous, especially when you have just been paid and have a birthday coming up.At the end of June, I made a Cult Beauty order having had my eye on a new launch. When I say new launch, what I really mean is a re-launch. 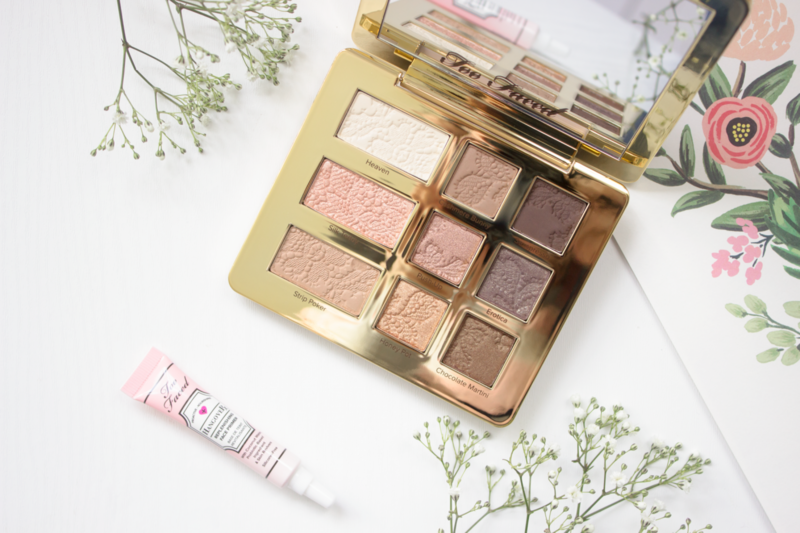 Too Faced recently updated a few of its best-selling products and in general it is fast becoming one of my favourite brands, everything I have tried so far has been really great, particularly their Sweet Peach Palette* which I just adore! Therefore when I heard that they were re-vamping their much loved Natural Eye Neutral Eye Shadow Palette, I waited for the re-launch and boy oh boy am I glad I did. I also decided to treat myself to a bronzer which is pretty much unheard of from me as I very rarely reach for them. However having had a recent photo taken a few weeks prior to my order I decided that I looked remarkably pale and that I definitely needed something to warm up my complexion a little bit, therefore I decided to treat myself to the Too Faced Milk Chocolate Soleil Bronzer, in which having ordered these two products combined I qualified for a deluxe sample of the Too Faced Hangover Primer which I had only ever read positive things about. 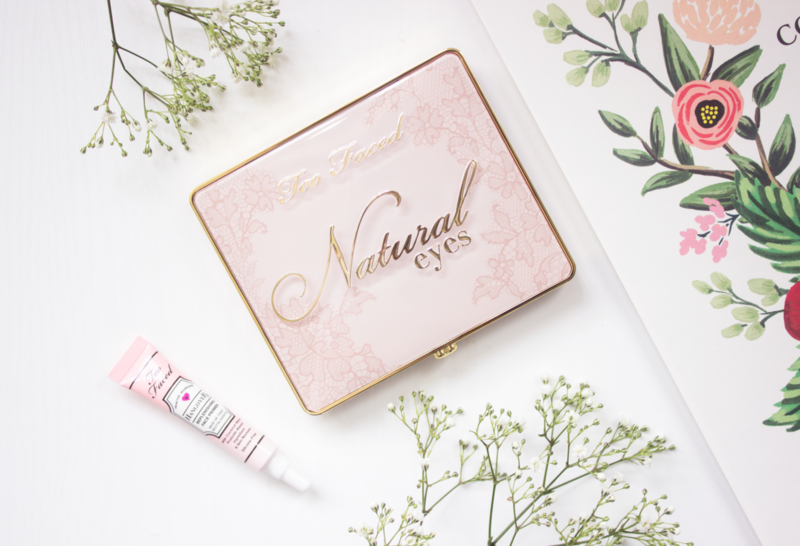 The Too Faced Natural Eyes Eye Shadow Palette is perhaps the most beautiful eye shadow palette that I own in terms of the packaging alone. It is feminine, delicate and extremely pretty with its pink design, gold detailing and lace print pattern. The palette contains nine shades, four of which are matte and five shimmers. Upon opening the palette, you are hit with quite a strong scent of vanilla, I personally don’t mind this however it is quite strong so it is something to note if you’re not a fan of vanilla or indeed strongly scented make up products. The packaging seems to be relatively sturdy, so I don’t think you would have too much trouble if taking this on holiday or away for the weekend, it should be safe. As the name suggests, it is a natural eye palette therefore all of the shades included are nudes, ranging from light pinks and matte browns to taupes and golden hues. It is a palette that you could use for daytime and evening as you can easily amp up your look with the eye shadows you have, therefore I do think it is a great all-rounder. My favourite shades out of the palette have to be Strip Poker, Push-Up and Cashmere Bunny. 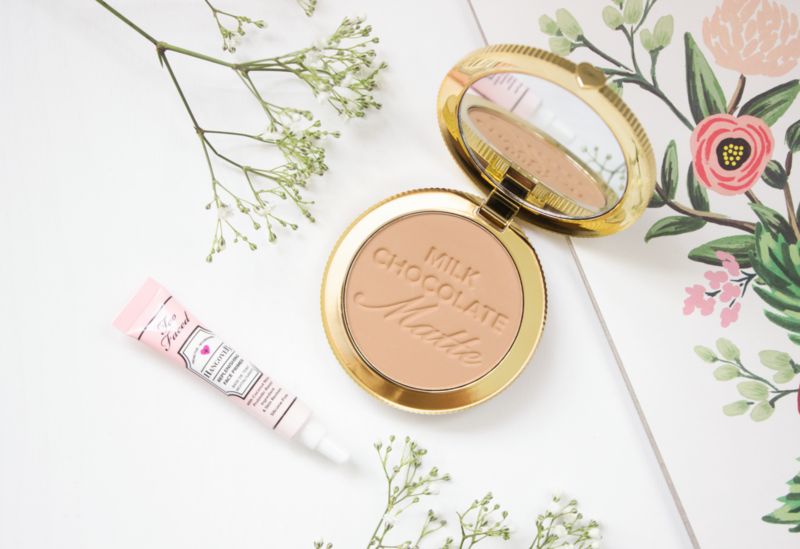 The second item I picked up was the Too Faced Milk Chocolate Soleil Bronzer which I chose after hunting for a nice bronzer which wouldn’t make me look like I had been tangoed. I was aware of this from several reviews online, therefore I decided to give it a try whereby I have to say that I have not been let down at all. 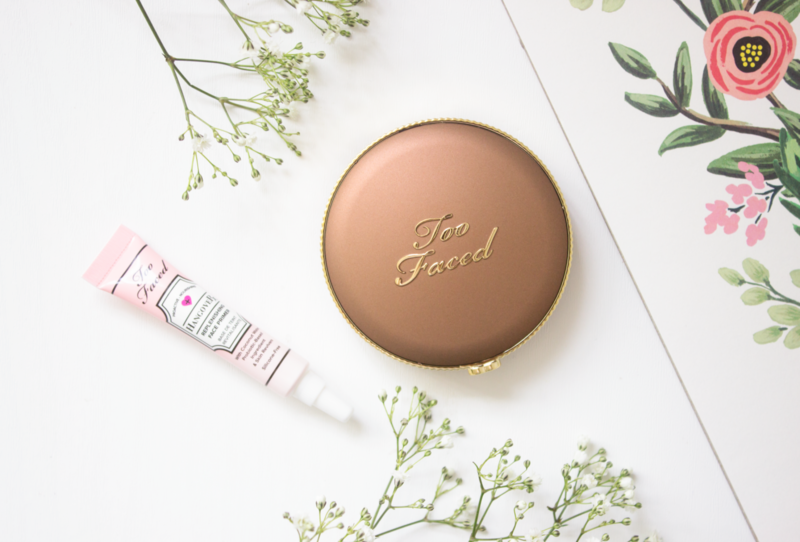 Once again this is an item which has been re-vamped by Too Faced in terms of its packaging and of course it is lovely, however I do think I prefer the original packaging of this one. It does look very girly and childlike in a way, generally I do like the simpler looking products with sleek packaging however this is the new design, so I will just have to get on with it.This is a matte bronzer which smells of chocolate, hence the name. It is, I would argue fairly warm in tone, however it doesn’t look orange on my skin at all. It adds warmth and a nice healthy glow to my skin which I really quite like, and that’s coming from a girl that rarely wears bronzer of any form. I have found that I can build this up to add a really natural glow to my skin without it applying too strongly, it is pigmented but it builds up nicely. Having really enjoyed both of these products from Too Faced I am looking to expand my collection further, what would you recommend? Both products featured here today can be found on Cult Beauty.